Spinal stenosis is a painful injury that can significantly affect your quality of life. If you've been diagnosed with spinal stenosis following a motorcycle accident caused by another party's negligence, you may be entitled to compensation. Spinal stenosis is a condition characterized by a narrowing of the spaces between the vertebrae in your spine. This can place pressure on the nerves in the spine that transmit signals throughout the body and cause chronic pain. There are two main types of spinal stenosis: cervical stenosis and lumbar stenosis. Cervical stenosis is a narrowing of the part of the spine in your neck. Lumbar stenosis is a narrowing of the part of the spine in the lower back. It's possible to suffer from both types simultaneously, but lumbar stenosis is more common. Symptoms of spinal stenosis typically become more noticeable as time passes. If your motorcycle accident also involved other injuries, symptoms may initially be mistaken for a different condition. Using a cane or walker may also help relieve pain by allowing you to lean forward slightly when walking. While treatment is successful for controlling pain in many cases, some individuals may experience difficulty with balance and walking to the extent that they are no longer able to return to the work they did before being injured in a motorcycle accident. Spinal stenosis is most likely to affect the earning potential of individuals who are required to stand on their feet for long periods each day such as factory workers or retail salespeople. A personal injury claim from a motorcycle accident can include compensation for medical expenses, lost wages, and pain and suffering. You can still receive compensation even if you were partially at fault for the accident, although your settlement will be proportionally reduced by your assigned percentage of fault. The defendant had a duty to act in a safe manner. You suffered specific compensable damages such as medical bills related to your injury. 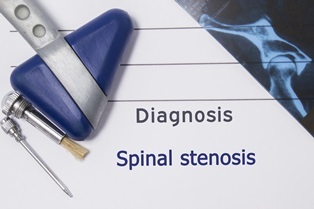 Proving causation for a personal injury claim involving spinal stenosis can be challenging. In addition to being caused by trauma from a motorcycle accident, spinal stenosis can be the result of tumors, thickened ligaments, herniated discs, an overgrowth of bone, or congenital deformities such as scoliosis. Spinal stenosis also becomes more common in people over the age of 50 due to age-related degenerative factors. To prove your injuries are the result of the motorcycle accident, you'll be asked to produce copies of your medical records and test results. Testimony from medical experts familiar with spinal stenosis can also be used to establish causation.